3Dwalkthroughs.com came across a press release from CyberExtruder announcing that they have just received patents from both the United States Patent and Trademark Office (USPTO) and the World Intellectual Property Organization (WIPO). The patents, entitled “Apparatus and Method for generating a three-dimensional representation from a two-dimensional image,” protect the company’s process for automatically creating a 3D model of a person’s head from just a single 2D image. The technology covered by the patents is used in the biometric security and animation and entertainment industries. In biometric security applications CyberExtruder’s system enhances facial recognition matching scores (particularly in surveillance applications) and mitigates the effects of facial expressions, a key degrader of facial recognition systems. A pilot program administered by the US Army with an eye towards developing a better lie detector demonstrated that the company’s system can also be used in automating expression recognition. In addition to providing this system to the biometric and entertainment industries, the company is also leverage innovations in rapid prototyping technology to create hard goods, like cameos, personalized action figures and even individualized candy molds, which will be marketed directly to consumers via the internet. 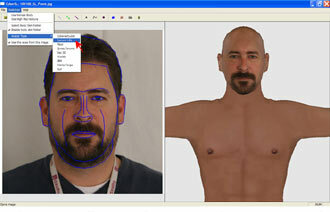 CyberExtruders automated system renders the unique 3D shape of any individual from just a single photograph. Their technology is currently being used to create photorealistic 3D avatars to be used in 3D virtual worlds such as Second Life and There.com. This entry was posted on Saturday, November 15th, 2008 at 9:45 pm and is filed under 3D Floor Plans, 3D Renderings, 3d virtual trade shows. You can follow any responses to this entry through the RSS 2.0 feed. You can leave a response, or trackback from your own site.